The 6' long Expanded Steel picnic tables with rolled edges are perfect for high traffic parks and recreational areas. The expanded steel is smooth to sit and eat on, and the rolled edges provide added comfort and safety. 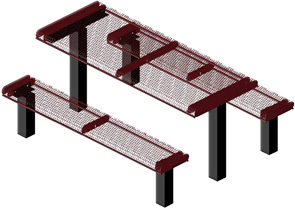 The 3/4" # 9 Expanded Steel tops and seats are supported by 4" x 4" frame posts to ensure maximum durability that will last years of commercial usage. 4" x 4" Support Posts. All wheelchair access picnic tables, conform to latest ADA specification. 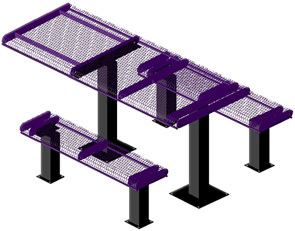 For extra safeguarding, an optional Anti-Vandalism Bar is available to add extra support to ADA overhangs. 8' long Universal Access Picnic Tables are also available to order. These ADA approved models come with one 2' overhanging side to allow for wheelchair clearance and easier access to the table top. 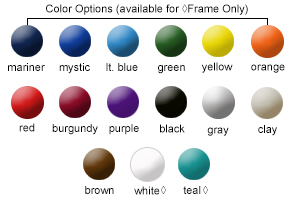 Table tops and seats are available in a lightly textured matte Polyethylene finish with color options as shown below, and the steel frame posts are powder-coated to match.